Today was Martha Grace's 8 week jabs. I don't know why I was dreading them. Considering this time 8 weeks ago she had Open Heart Surgery -today's jabs were nothing in comparison. But I chickened out, luckily Mark is off all this week so I left it to Daddy to take her to the surgery for them. 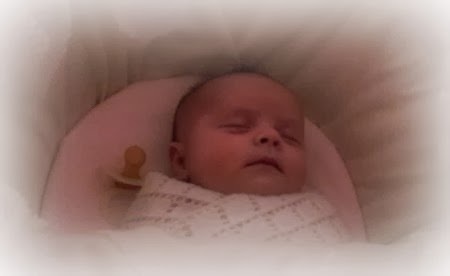 I wasn't too bad with Isabella, I could take her to get them without worrying; but Martha has already been through so much I just couldn't bring myself to hold on to her knowing the Health Visitor was about to stick a needle in each thigh and inflict pain on her. I know she needs them, it's far more dangerous for her to go without these jabs - but it just seems so cruel. excrete it in their stools (excuse the TMI) for up to seven weeks. This isn't ideal, especially if we get the appointment for the next op in the meantime - Health Visitor suggested she might need to be in a room on her own incase she passes it on to any of the other children there who haven't been immunised against it. She was weighed first (3.7kg today) and then Dr Ben came to check her over. I took Isabella to the waiting room while Mark stayed with Martha. I heard her scream once, I heard her scream twice and then I knew it was over; we came prepared with her lunchtime bottle so Mark had started to feed her as a distraction from the pain. As soon as we got her home we tried giving her the rest of her bottle but she wasn't having any of it; we gave her a dose of Calpol and swaddled her - she slept until nearly 4pm. 1) We found a car we like. Mark test drove it, was offered a decent price for his car, my dad likes the car - so we're going back tomorrow so I can take it for a spin. Looks like the car search might be over. 2) Isabella almost burnt the house down. Mark sent me to bed with my headache so while he was in charge Isabella wandered off in to the kitchen and turned all the dials on our stove. We had plastic party plates left over from Sunday on one of the ceramic hobs, you can probably see where this is going...so my house still smells of burning plastic. If I'd heard this story on the news I'd be thinking "Where were the parents when the child was doing this?" - he was only in the next room. You need eyes in your arse with these kids I tell thee. It seems at the moment that Martha Grace is rather an easy baby.